Federal Infrastructure Minister Francois-Philippe Champagne inaugurated the new Nuns' Island bridge on Friday Nov. 9, 2018 with a ribbon-cutting ceremony. A new bridge connecting Nuns' Island to the rest of the city of Montreal will open to drivers, pedestrians, and cyclists on Monday Nov. 12. Federal Infrastructure Minister Francois-Philippe Champagne inaugurated the bridge on Friday with a ribbon-cutting ceremony. The new Nuns' Island bridge has four lanes for vehicles in each direction, and a bicycle/pedestrian path that will be open year-round. As of Monday one of the northbound lanes will be reserved for buses, and one southbound lane will be reserved for crews working on the new Champlain bridge. The new bridge will have a dedicated left-hand turning lane for those turning onto Highway 15 North, although it will only be in mid-December that access from Highway 15 North to and from Atwater Ave. will be opened. 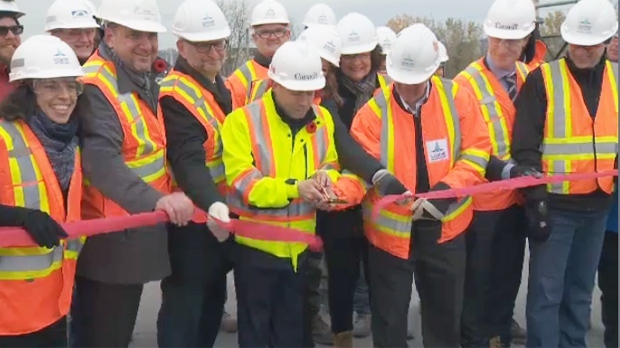 At the inauguration federal officials confirmed the new Champlain Bridge structure will be finished by Dec. 21, but that it could take until June 30, 2019 for waterproofing and paving of the roadway to be completed and for the bridge to open to traffic. Once the new Champlain bridge is open, crews will begin work on the rail lines that will be used by the REM.